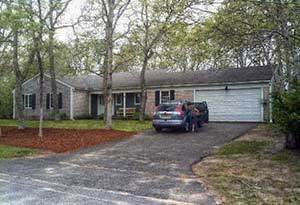 This front of this home is free of bushes and trees that hide windows or doors and thus provides a clear view from adjacent houses and from the street. Thus, in front at least, there is no place for intruders to hide while trying to break in. Trees on the side of the house are another matter. They do obscure vision and thus provide a measure of privacy - not good for security. You can't always be home to protect your valuables. Most home break-ins are committed by those who are looking to score quick and easy. Don't make it easy and make the quick more difficult. There are steps you can take to help keep your home more secure which will discourage the less committed. Most intruders or burglars try to avoid trouble. The simple fact that your home may be alarmed prompts many intruders to find greener pastures elsewhere. Therefore a simple alarm company decal displayed on the front door or its windows (and rear also if you have one) of an apartment or home will fend off the more skittish. Of course this can not actually stop a determined intruder. Neither will an alarm from an installed system. It too may not stop an intrusion but if loud enough it might prompt a quicker exit. There are a lot of wireless self installable systems available that might fit this purpose. Security system monitoring is an extra important step that alerts a company monitoring station of an alarm so that law enforcement can be contacted and respond if you are not at home. But perimeter security systems also have limits. They can often be breached without setting off an alarm - its costly to alarm every window and door as well as basement access. Thus, a security system is greatly beefed up by including some kind of inside the house motion protection or beam (that if broken sets off the alarm). Seeing a "Beware of Dog" sign will make most potential intruders think, "Do I want to avoid this potential trouble?" If your house has not been specifically targeted, an intruder looking for opportunity may just move on. A dog in your home can also serve as a live alarm. Dogs' hearing and sense of smell are very acute. They can sense potential intrusion before you do, although false alarms are often prevalent. Overall, however, dogs can serve as an excellent early warning system, if you are there. But if you aren't, and they sound threatening, dogs can give a potential intruder pause. Dog bites can be painful. They can also be difficult to deal with. Even a small dog with a high pitched yap can sound an alert, and nip an intruder's heels. I knew a guy in Buffalo who rigged up his homemade security system not to an alarm but to a recording of a large vicious dog barking. He swore by it. Posting a "Beware Of Dog" sign can also be a deterrent. So can an actual dog outside the home (as many postmen can well attest). A dog house that is easily seen can serve as another deterrent. 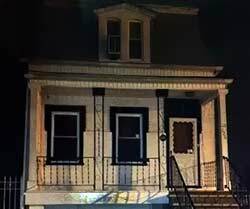 This house sits completely dark at night along a populated city street in the Bronx, NY. There is no indication that anyone is at home. It is almost an invitation. If you live in a house, your absence is often signaled by the absence of lights or sounds. At night a dark, quiet house with no car in the driveway gives out a sort of welcome sign to the unwelcome. So if away, keep a light on. Maybe even a radio or TV. Even better, keep lights or radios on timers when not at home. Their going on and changing location will look like someone inside is moving around. This apartment building uses outdoor flood lights at night to illuminate side areas of the structure venerable to break-in. One counter measure to beef up a house's exterior when it is dark outside is to install exterior flood lights. They provide decorative accent and make your exterior potentially visible to neighbors, those on the street and in passing cars. This advice doesn't apply to front porch lights. They signal that someone is expected and when coupled with a dark house this combo signals that this someone is you or a member of the family and that no one is home presently. 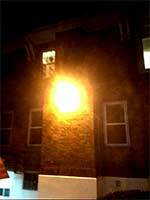 Another variation of light used as a counter measure is to install motion activated lights. An important location for these is around driveways. Thus when you pull into your driveway the immediate area will be lit. These same lights are also useful in the back yard or on exterior decks. If people are creeping around, sudden lighting is unexpected and will scare the less determined. They can also alert you to movement outside. 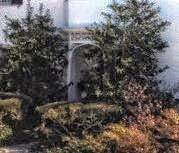 In this close up of a homes front door area, tall bushes around the front doorway give intruders a place to hide. Even worse they give an attackers a place to wait for you unobserved. The more secluded your house is, the less threatening will be your home's exterior. Bushes and trees around windows or entrances might look great, but they also provide cover. So if possible, keep bushes to a minimum and if they must be there keep them cut low. Some people plant prickly green bushes in their yard or under windows as a deterrent. A good option for under windows is a rose bush, but there are many other thorny options too. Check with a local gardening center for advice. Cost, maintenance and local climate considerations need to be considered. Thorny bushes might provide just enough ouch factor to secure window areas from those who are not dedicated. Another green security option is to build a prickly hedge as a barrier around your property. Similarely, a wire, wood or metal fence can be used for the same purpose. But as with tall greenry, if your fence is tall and can't be seen through, it becomes a screen. Many years ago when living in Washington, D.C. I was invited to visit a friend's home. It was in a very rough part of town. When I arrived, I found his home ringed by a high metal fence and roaming around inside were three very scary looking, aggressive Doberman dogs -- not a place I would venture into unannounced. This ground floor apartment window on a Bronx, NY apartment is protected from intrusion by heavy metal bars - good advice for lower floors in urban and other crime prone areas. This means that when you are out, keep your doors locked and windows too. If you have sliding glass doors don't just lock them but insert a long square piece of wood to fill the slide path of the glass door. As to most door locks, they are pretty pathetic in terms of protection. Doors are too. The best doors are made of thick wood. Locks should include the added protection of deadbolts. The lock should also include a strong strike plate (that attaches to the door frame). Many of these are flimsy. You want your lock to resist an attempt at resist forced entry and hammering. You also want your door lock to resist picking. Pick a high security lock such as made by Medeco. They are more costly, but are worth it since they are almost impossible to pick. Most high security locks also feature hardened cylinders. They can frustrate attempts to drill them out to gain entry. 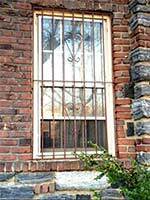 If you live in a basement or first floor apartment in an urban area or an area that is not secure from crime, make sure there are window bars or at least heavy wire screens. Some people in more secure areas just seal their windows and as a fail-safe, They often also utilize a security system that monitors the window glass for break-ins. If you live on a higher floor be sure there is a barrier fortifying an escape window to a fire escape. Remember a fire escape can be used as an entrance to your apartment too. No lock is secure if copies of its keys get into hands of criminals. Too many people move into apartments or homes and just keep using the keys they were originally given. Over time the keys they inherited may have been given out to family members, neighbors, friends, professionals doing work inside the residence and others. In short: the keys you inherited with your new residence may have been compromised. The same process can happen with you. Even when you start with new locks and keys, over time you can easily lose control of who has access to entry. So change your locks when you move. And if you give keys out, keep the duplicates at a minimum and distributed only to the most trusted. Also consider limiting duplicate keys to just one entry door and have the lock(s) changed on a timely basis. Another solution is to install a keyless touch pad entry system. While they have the option of allowing codes to be easily changed (a good security feature), many of these locks have also proven to more easily tampered with and broken. So be careful in you decisions. Get advice from you local locksmith. When I finished this article I showed it to my wife and asked for her opinion. After reading it she said, "Isn't this all just common sense?" "Yes," I replied. "But as Mark Twain is often quoted as saying, "Common sense is very uncommon." And after driving around local streets and neighborhoods, especially in the evening and night, I saw house after house making every security mistake in the book. Many were just inviting unwanted visitors. So think about your house and its security. A few small changes could save you a lot of headaches later. Christopher Caile is the founder and Editor of FightingArts.com. He was once the founder and President of a private telephone system company in Buffalo, NY that also installed, monitored and serviced security systems.